From novice to professional, an air compressor provides the power needed to operate a variety of tools or perform jobs that require pressurized air. A tankless air compressor can come in handy at home or on the road. Inflating an air mattress, raft, or a flat tire is fast and easy with these compressors. A compact size and lightweight design make them easy to store and use. 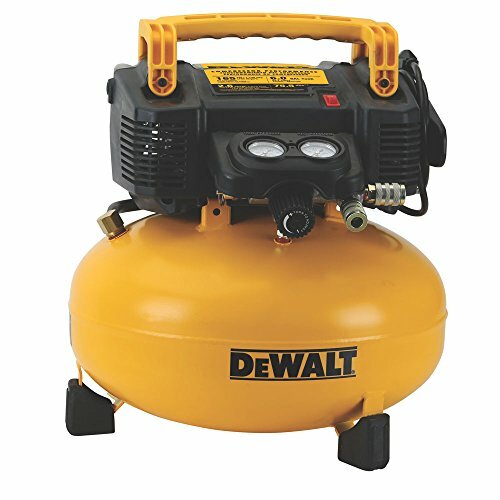 Portable air compressors will often include a tank to store air in and can be used around the house for smaller projects. From painting with an airbrush to driving fasteners with an air gun, they provide a consistent PSI for air-powered hand tools. They will also inflate those items that a tankless compressor can. An industrial air compressor is an important tool for professionals, but if you are looking for a quiet air compressor these are usually pretty far from quiet. A high PSI and CFM rating allow one or more workers to complete their work efficiently and quickly. From the construction site to the local garage, these compressors generate high levels of air power and tank storage. What follows is a general overview of the benefits and features found on a quality air compressor. We then look at ten products that provide the design elements found in the best air compressors. These devices use an engine or motor to generate pressurized air. An air compressor that is attached to a tank will store the air until it reaches a certain pressure rating before shutting off. This air is held in the tank until it is needed. As the stored air is used, the pressure in the tank will drop and the engine or motor will switch back on to generate more air. Tankless Compressors: are often used for jobs such as filling flat tires or inflating air mattresses. The main design feature for a tankless unit will be its compact size. They are lightweight and can be stored easily. Their limited power prevents them from generating high PSI so they should be used for occasional small jobs or in emergency situations. Portable Compressors: will be a step-up from a tankless unit in many ways. 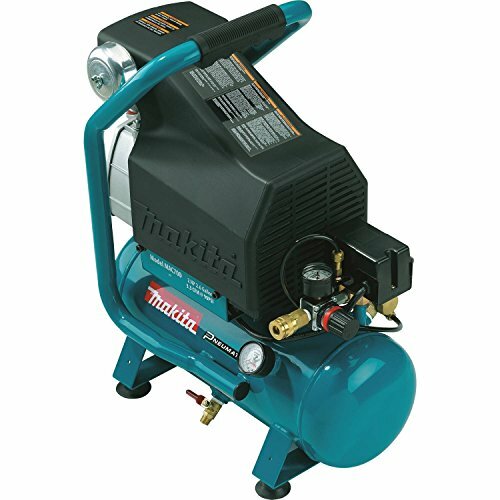 These compressors are designed to be used for small jobs around the house including air guns or airbrushing equipment. Various small or medium-sized tanks can be attached to these devices, and they are capable of generating enough power for everyday use in non-commercial settings. A major consideration for this type of air compressor is the noise level that it generates during use. Industrial Compressors: are built to handle the heavy workloads found in professional settings. This type of compressor will use medium or large-sized tanks and will supply high levels of PSI for extended durations. The unit will typically be larger and weigh a lot more than a portable tank, requiring a stationary location or wheels if it must be moved. High powered air supply and multi-user abilities are desirable features on these compressors. Size and Weight: will be the first thing to look at. A tankless compressor can be small enough to fit into your glove box, but will only provide limited air for occasional uses like inflating a tire. Professional carpenters or roofers will require a large compressor and tank that can supply multiple air-powered tools with air for the entire day. Homeowners who plan to use the compressor for projects around the house can probably get by with a portable set-up. PSI and CFM Ratings: are important measurements that will determine what the compressor is able to provide. PSI (Pounds per Square Inch) let you know the length of time you will have to wait for the tank to fill. A higher rating cuts down the time a job will take and will offer more air for larger jobs. CFM (Cubic Feet per Minute)rates how fast the air will flow from the compressor and can tell you how much work the compressor will be able to handle. Tank Size: will be measured in gallons, with larger tanks allowing you to work longer with less downtime. Larger tanks often provide multiple outlets for two or more tools and will be favored for large projects or commercial uses. Avoid larger tanks with a low PSI rating that will not perform to your expectations. Sound Levels: are measured in dBA (decibels). This can be an important consideration, as loudness may influence when and where it can be used in residential settings. Generally, increasing the level by 10-dBA will double the volume during operation. Electrical or Gas: power is another consideration. An electrical motor will only go as far as the length of the electrical cord attached to it, while a gas engine has greater mobility but produces fumes that are unsafe indoors. Product Overview: The compressor weighs 30-pounds, keeping it in the portable range. A high-flow regulator allows for maximum tool efficiency while a control cover and rubber leg-covers protect the unit and the surface it sits on. Stand Out Features: This portable can produce up to 165-PSI during cold and warm weather. Why is this a good air compressor? 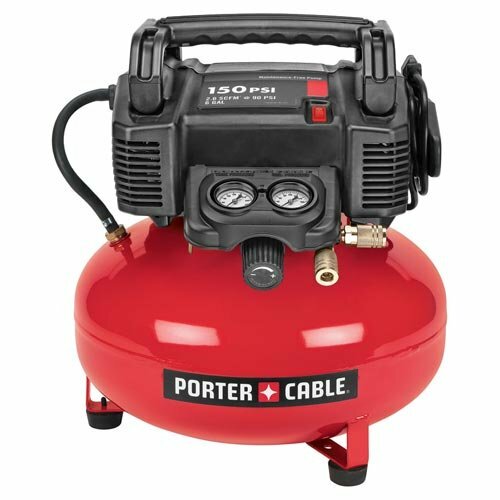 : This portable compressor offers strong performance for home projects. Product Overview: An oil-free pump helps to provide cleaner air to the tools. A thermal overload protector provides extra safety and longevity for the unit. The extended handle and wheelset provide comfortable portability. Stand Out Features: A 60 dBA level rating makes this compressor a quiet running unit. Why is this a good air compressor? 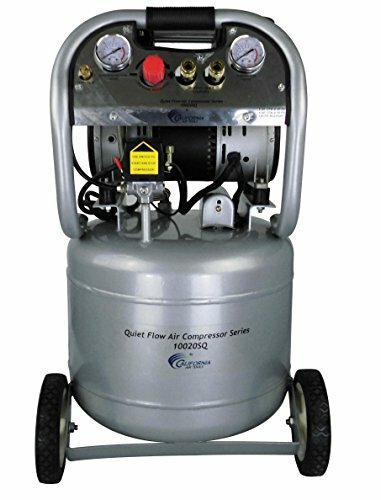 : The quiet operation allows this compressor to be used nearly anywhere at any time of the day. 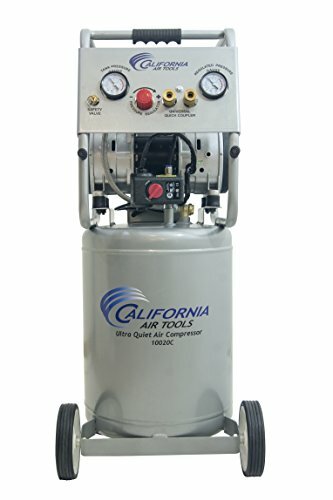 Product Overview: With a six-gallon tank, this compressor provides up to 150-PSI and 2.6 CFM. A variety of pneumatic tools are included for finishing and trim projects. 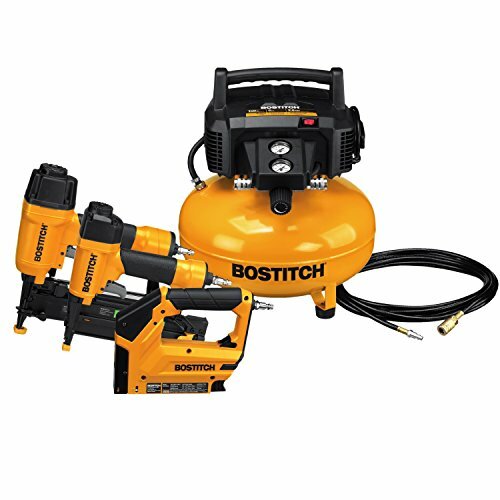 Bostich covers the combo kit with a one-year limited warranty. Stand Out Features: The combo kit comes with a brad nailer, finish nailer, and a crown stapler. 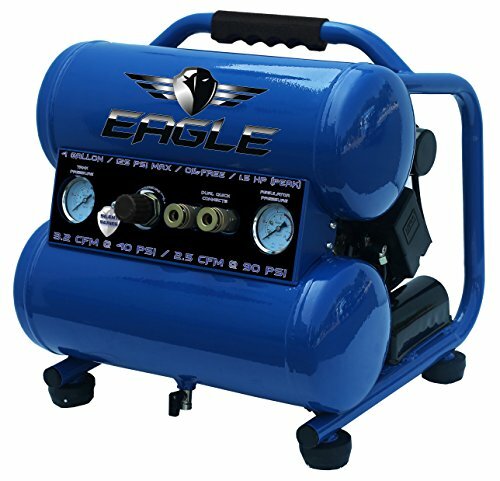 Why is this a good air compressor? : The ability to connect the combo tools makes this a time saver. Product Overview: A dual-tank design keeps the unit smaller but can provide 130 PSI continuously. The larger cylinder allows it to recover faster and a thermal overload provides motor protection. A large air filter offers greater intake. 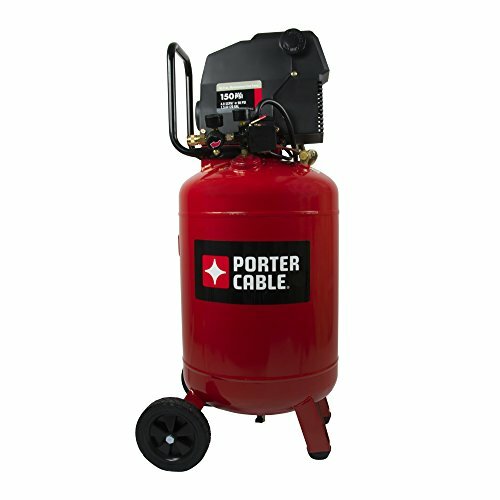 Stand Out Features: A highly durable body will keep this compressor protected in workshops and home garages. Why is this a good air compressor? : The CFM rating on this unit indicates the high air flow produced, even at higher PSI settings. Product Overview: The portable unit weighs 30-pounds and includes a six-gallon tank. Maximum pressure rating is 150 PSI, with 2.6 CFM at a 90 PSI setting. The accessory kit provides various air nozzles and tips. Stand Out Features: Factory installed air coupler, plug, and extra accessories make this ready to use out of the box. Why is this a good air compressor? : The 13-piece accessory kit provides ait components that most homeowners will find useful. Product Overview: A 2-HP engine generates approximately 70 dBA noise during use. It can generate up to 6.4 CFM at a 40 PSI setting. Dual tanks store 4.6-gallons of air and made from rust-free aluminum. Stand Out Features: This unit is designed for high air volume applications at lower PSI settings. Why is this a good air compressor? : A dual piston design makes this a long-life compressor for a home shop or garage. Product Overview: Up to 5.0 CFM can be generated at 40 SPI with this oil-free pump. The motor supplies 1.5 HP and uses high-quality windings for greater longevity. Seven-inch rubber wheels allow this verticle set-up to be wheeled around over semi-smooth terrain fairly easily. Stand Out Features: The ASME certified tank can hold 20-gallons of air. Why is this a good air compressor? : One tank of air will suffice for most small jobs at home. Product Overview: A 2.0 HP motor is equipped on this compressor. Up to 130 PSI can be generated with a max CFM of 3.8 at 40 PSI. The pump operates with fewer voltage drops and reduced breaker trips during operation. Stand Out Features: The Big Bore design lowers the decibels while providing a higher power output. Why is this a good air compressor? : The design elements make this compressor highly-durable. Product Overview: Two stacked tanks can store four-gallons of air. The 1.5 HP motor generates peak 3.2 CFM at 40 PSI. This compressor has a maximum 125 PSI rating. It employs an oil-free double pump. Stand Out Features: The unit draws low amps and can last up to four times longer than other products. 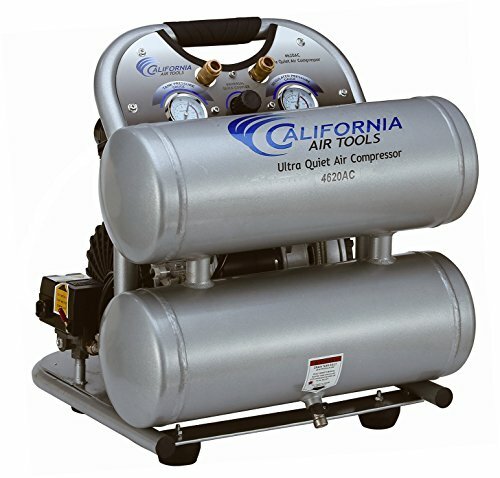 Why is this a good air compressor? 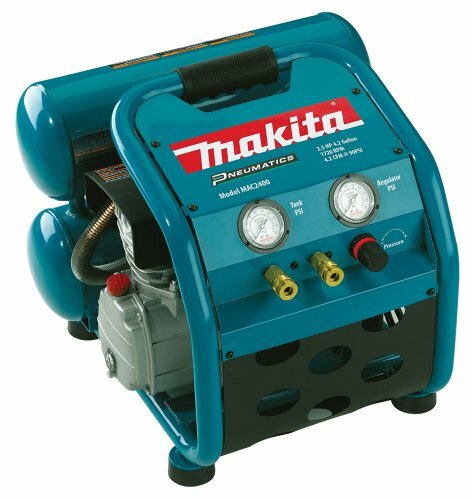 : Rated at 47 decibels at 25-feet, this is a quiet running compressor. Product Overview: An oil-free pump provides cleaner air and reduces maintenance. A lower 14 amp draw and thermal overload protection increase motor life. A ten-gallon verticle tank offers increased storage with fewer refills required. Stand Out Features: The 2.0 HP motor operates at a lower RPM range that produces lower decibels for its size. Why is this a good air compressor? : Two universal couplers allow multiple air-powered tools to be connected to save users time.